Abbas's adviser calls attack 'heroic operation,' Fatah welcomes it and 'escorts the martyrs to paradise' as the candy is passed out. Palestinian Authority (PA) Chairman Mahmoud Abbas's adviser and members of his Fatah faction have come out and directly praised the terrorist attack in Jerusalem on Tuesday in which five Israelis were murdered in a synagogue, after Abbas's office made a perfunctory condemnation of the attack. Abbas's adviser Sultan Abu Al-Einen, who praised another terrorist as a "hero" last month, called the lethal attack with hatchets, knives and guns on Tuesday a "heroic operation" on his Facebook page, reveals Palestinian Media Watch(PMW). In the post, Al-Einen put up pictures of pools of blood and Jewish victims on the ground in prayer shawls, as well as a photo of the dead terrorists with a bloodied butcher's knife beside them on the ground. Al-Einen wrote "pictures from the scene of the heroic operation at the religious Zionist institute, in response to the assassination of martyr Yusuf Al-Ramuni 'Abu Jihad.'" The reference to Al-Ramuni relates to an Arab Egged bus driver who committed suicide on Sunday night, as proven by an autopsy. Those results did little to dispel the incitement and riots encircling Jerusalem. Al-Einen was joined by spokesperson Jamal Tirawi of Abbas's Fatah faction, who said in the name of his faction that they "welcomed the martyrdom-seeking operation in Jerusalem" and were "escorting the martyrs of the Abu Jamal family to paradise," PMW reported citing Donia Al-Watan News. Fatah celebrated the attack, announcing on its official Facebook page that, like Arab residents of Gaza and the family of the terrorists in Jerusalem, people under their rule were passing out candy. "Handing out candy in the cities of the West Bank in celebration of the Jerusalem operation, which was carried out to avenge the execution of martyr Yusuf Al-Ramuni and the violations at the Al-Aqsa Mosque," Fatah wrote on its official page. The various celebrations were added to with a video on Fatah's Facebook page of a bodyguard of former PA Chairman Yasser Arafat. The bodyguard was interviewed by BBC Arabic in April, and explained that Arafat condemned terror attacks due to international pressure - but lied when he did so. Fatah posted the following text with the video: "for those who argue with Fatah: Why the PA condemns self-sacrifice operations!" The content became unavailable shortly after it was posted, reports PMW. Prime Minister Binyamin Netanyahu on Tuesday noted in his speech following the attack that while Abbas condemned the murder, he went on to spout incitement and demand "an end to the invasions of the Al-Aqsa Mosque, the provocations of the settlers, and the incitement on the part of several Israeli ministers." 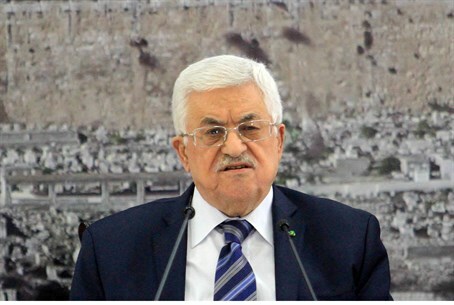 Speaking of incitement, PMW revealed on Tuesday that PA Supreme Sharia (Islamic law) Judge and Abbas's adviser Mahmoud Al-Habbash on PA TV on November 5 directly said that Abbas is inciting religious war.